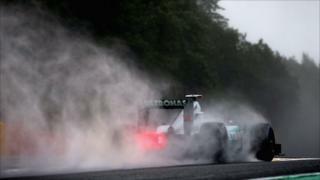 The second practice session for the Belgian Grand Prix is washed out at Spa-Francorchamps, with no cars setting a timed lap. Heavy rain meant teams, other than to run installation laps, declined to run for the majority of the 90 minutes, although spins for Caterham's Heikki Kovalainen and Marussia's Timo Glock gave spectators something to discuss. Ferrari's Fernando Alonso leads the world championship by 40 points from Red Bull's Mark Webber heading into the 12th round of the season.